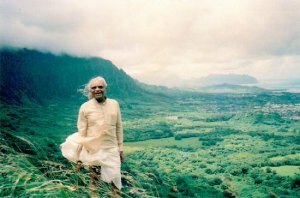 This is perhaps one of the most widely used photographs of Guruji. It was taken in 1987 on top of the Pali Highway on O’ahu. It overlooks the windward side of the island toward Kane’ohe. I drive by this spot every day on my morning commute and always think of Guruji when I pass it. The photo was taken by Penney Sing, who is a dedicated Iyengar student at the Intermediate Junior I level. 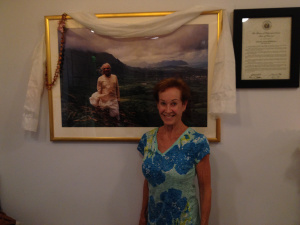 She has always been a rock in the Iyengar community here on O’ahu. I was fortunate to see her a day after Guruji’s passing. I gave her a big hug as we were coming out of a workshop with senior teacher Laurie Blakeney. She expressed sadness, but was grateful that Laurie kept the theme of the class light in spite of the gravity of the week.